Mirepoix – onions, carrots, celery – is the foundation of classical cuisine. Finishing salt heightens food’s flavors and is a pillar of great taste. We have combined these cooking fundamentals in a single jar by infusing our 100% pure Amagansett Sea Salt with fresh onion, carrot, and celery and blending them together. We suggest using this finishing salt blend on any savory dish. One of our great joys is visiting restaurants and artisans that we supply our salt to. It is a thrill meeting these very talented professionals and hearing what they do with our salt. On a recent trip to NYC, we had a fantastic dinner where the chef sent three small bowls – one containing onion salt, one carrot salt and one celery salt – to the table to accompany a perfectly cooked sliced beef tenderloin entrée. The salts made for an incredibly beautiful and flavorful presentation. 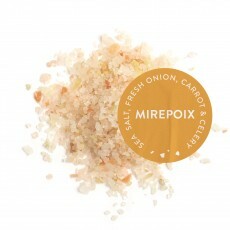 This Mirepoix Sea Salt Blend is our take on this idea.